Wednesday, January 2, 2013 – At 0250 hrs. 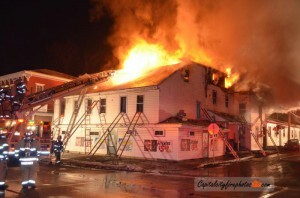 Box 88-2 was dispatched for a Working Building Fire at Demps Tavern 293 East Main St. in Middletown Borough. It was reported with possible entrapment as there were apartments on the second floor of the building. Rescue 40 responded after Command 88 upgraded to a Second Alarm Fire, Rescue 40 arrived and assisted with a search of the first floor but was backed out due to collaspe of the second floor as fire quickly tore though. Crews were then assigned with extensive overhaul of the building after initial companies on scene made an agressive attack on the blaze. A good job was done by all companies, Rescue 40 was at the scene for almost 3 hours.